There’s no need to sacrifice a sleek silhouette in favor of generous storage…at least not with Moe’s Colvin Shelf with Drawers. A clean-lined contemporary design is tempered with the warm, well-grained look of quality mango wood and a slender yet stable base of durable iron. Eight open areas accommodate all manner of display-worthy décor, while three generous drawers allow for ample stashing. 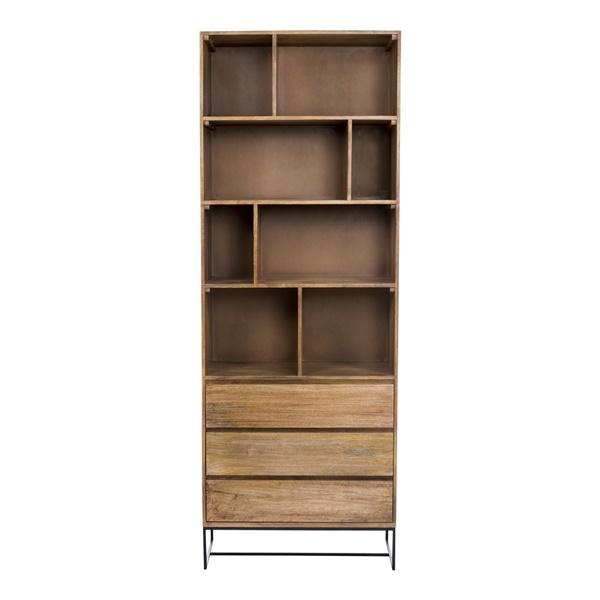 On its own or along with other Colvin pieces by Moe’s, the Colvin Shelf with Drawers is a stylish solution to storage needs throughout the home. Unique combination of rustic and refined. Expert construction of solid mango wood. Spacious storage within a sleek silhouette. Eight open areas of varying sizes. Coordinates with Moe’s other Colvin pieces.